Very nice, great tasting recipes. This book is fabulous. Everything we have tried has come out better than expected. Also may help that we have the complete set of jars for doing this process, which adds more fun, as everything looks so beautiful in all jars. Anyone that has doubts, I would highly recommend trying this book, you won't be disappointed. I bought this to go with the fermentation crock that I purchased for a family member. She really loves it! She said she likes the variety and ease of the recipes. She’s ordered some for her friends! My brother and his wife, who I gave this fermentor and recipe book to for birthday presents, were very enthusiastic about it. The crock comes with a booklet but this book is an important component to the crock. In addition to fermentation recipes there are other great recipes to try. I purchased this book with the fermenter because I'm new to fermenting. The book has a lot of full color pictures but the print for the recipes is very small and light. I can hardly read the recipes. I made the fermented cabbage and it turned out very good, just wish it was easier to read. Good book but definately not worth the $30.00. Nice book, beautiful presentation of the recipes, but the print is entirely too small. Why go to the expense of printing such a lovely recipe book and have the print too small? I can read it; but my daughter, who is partially blind cannot, and I gave it to her as a gift. Tried recipe from the book was disappointed, bland tasting. I also thought there should be better descriptions of what to expect and how finished should look. This recipe book is somewhat lacking in helpful information. The recipes seem to focus on kombucha and kimchee. I have nothing against either of these but am more interested in sauerkraut. The one recipe I did try was an overblown mess. I don't think it worked. The ingredients, as listed, did not all fit into the jar. I may try something else but doubt I'll use this book again. 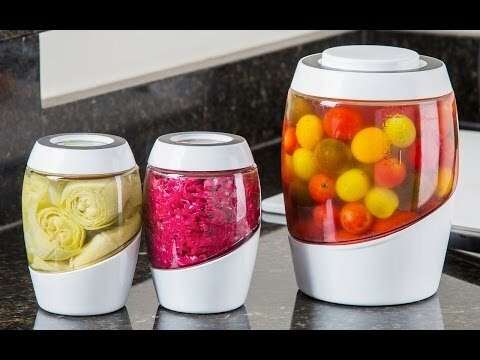 This fermentation pot will help you create nutrient-rich foods that are good for digestion . . . and it looks great doing it. If you’re not familiar, fermentation introduces helpful bacteria, or probiotics, to balance your digestive system and help it absorb more nutrients. It’s an age-old food preservation technique that—without the right tools—can be as messy as it is beneficial. You put your foods in a type of brine (usually a mixture of salt, water, and vinegar), and a delightful chemical reaction happens. Mortier Pilon creates the ideal environment for this biological transformation. This vessel has a futuristic look with clean lines, but the design has a purpose. As the organisms inside begin to grow, they create gases. The water seal lets those gases escape, while also keeping air out. An included weight makes sure your veggies stay submerged under the brine and outside the reach of unwanted bacteria. Get new recipe ideas fresh from the Mortier Pilon cookbook—like pickles and homemade sauerkraut. To keep track of your creations, update the rewritable label. To store your fermented foods in smaller batches, you can use their optional canning jars.